Miss Pepperday's Ice Cream from Butterfly Films on Vimeo. Want to have something different at your wedding or event? 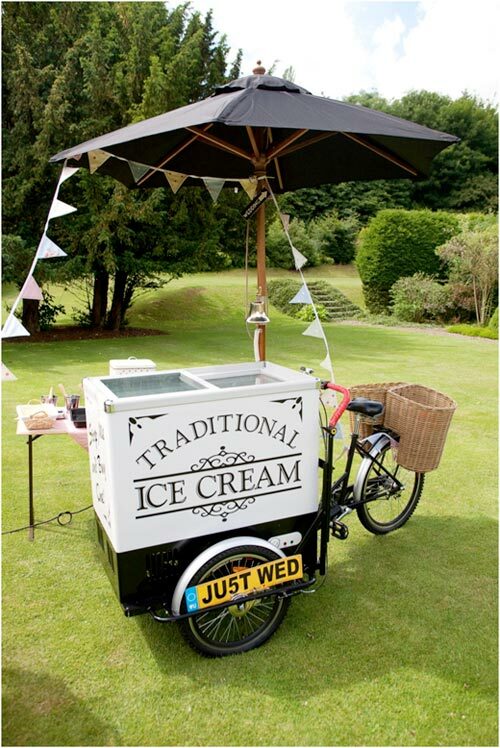 Be a leading lady and select this stunning 1950's vintage ice ceam tricycle filled with delicious luxury ice-cream . The attention to detail from specially selected cones, personalised wafers and friendly attendant attired in vintage costume is second to none. This 1950's tricycle looks stylish either indoors or outdoors. • A traditional and photogenic reproduction 1950's ice-cream tricycle. • A selection made by you of luxury double-cream ice cream. • A fully stocked ice cream bar decorated to complement your colour scheme. • A selection of flakes, sprinkles, cones and personalised waffle discs to personalise your taste experience. • For outside venues an elegant gazebo can be provided. • Experienced staff with an attention to detail. • Comprehensive Public liability Insurance. • Current Food Hygiene Certificate.